2012 C220 W204 Xenon headlamp swap. Discussion in 'Electronics' started by jammersp67, Feb 13, 2019. Looking at getting some genuine merc xenon units for my w204 to replace the standard halogens i have. The ones i've seen come with the ballast on the bottom and are genuine. But on looking at other threads (I haven't found my exact model) they go on to talk about levelling units (estate w203) and washers. I don't have a headlamp washer, so no bother there, but surely the levelling mechanism is in the headlamp? I also know i have to go to a merc garage to get the star system to set headlamps to xenon, does anyone know why that is? Also can you set that via OBD access? Any help with my deliberations would be greatfully received. The level sensor is in the suspension, and adjusts the headlights aim based on the load. Legally, HIDs require both the headlamp washers and the self-levelling mechanism. You may get away at MOT test without the headlamps washers, but the self-levelling mechanism is important or you could dazzle oncoming traffic when the car is fully loaded. Additionally, I believe you'll need to code them with STAR (and potentially also SCN-code the upgrade?). And last, you should declare the mod to your insurer. 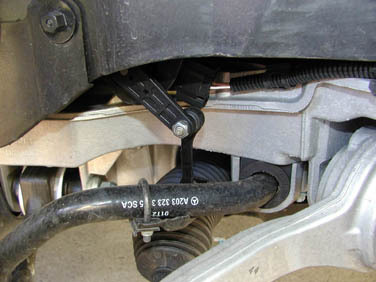 Some cars have a sensor in the front suspension and a sensor in the rear suspension as well. But in either case it is only fitted to one side of the car. You would fail an MOT now without working headlamp washers. On my MOT back in November, for the first time, the MOT tester, washed the windscreen ten times to ensure that the headlamp washers worked. They did thankfully. Talking to him after about that, as the car was absolutely dripping washer fluid after, he told me that in the latest MOT updates, they have to be seen to work. Hence the ten washes. If its a MOT thing then unless i can retrofit washer's I guess its a non starter. But any idea why this is a requirement? I've as yet to venture outside and have a look to see if i have the leveling kit, i do have a roller dial in the car, that adjusts the level of the existing lights? If you have thumb wheel next to the light switch you will not have the auto-levelling system. This was one of the best retrofits I had done to my S203 and the most expensive.. If you don't already have headlamp washers this will add approx £1200 (incl fitting) for a new bumper, new front cross member and the washer nozzles, loom and pump. You may need additionally a bigger washer bottle. I didn't as mine was the estate, already fitted with the larger capacity bottle. Olly had to do a massive amount of research as the MB WIS info was vague and downright inaccurate..
A good indie can do all this for you (Olly at PCS did mine). There will be a fair bit of coding required. As yours is a relatively modern model it may require on-line files from MB, so unless this is an officially available retro-fit it may not be that straight forward. In that case how on earth do I get brighter headlight without changing to Xenons?? ...In that case how on earth do I get brighter headlight without changing to Xenons?? You can opt for brighter Halogen bulbs (e.g. Osram Nightbreaker or Philips Xtreme / Racing Vision etc), they are cheap enough and easy to fit though they will have shorter service life than traditional (dim) Halogen bulbs. The other option would have been LED replacement bulbs (on new cars, LED superseded HID Xenon which is now obsolete technology anyway), but sadly Halogen-to-LED conversions are still illegal in the UK. EU regulations require that headlamps capable of 3,000 Lumens or more require headlamp washers to be fitted. Dirt scattered on the lense of a very bright light source can divert the light and may cause oncoming teaffic to be dazzled. This is also why the self-levelling feature is required, to ensure that the very bright light is not aimed too high when the car is fully loaded (i.e. as opposed to relying on the driver to remember to use the thumbwheel to adjust the headlamps aim height). So a car fitted with bright light - over 3,000 Lumens - but without the washers and self-levelling - does meet EU regulations (bar the self-levelling exemption for sports cars with stiff suspension and no load capacity). Regarding MOT.... I am not sure that not having headlamp washers or self-levelling will actually result in a Fail. My understanding is the MOT tester will test any existing systems fitted to the car to ensure that they are in working order, but I don't think that tester will fail the car because of a system that isn't there and was never factory-installed. Said that... this point is purely academic, because a mod not failing an MOT test is not in itself proof that the mod is legal or that it is safe. The Hyundai on halogens was dire. Now its fine. Certainly cheaper than swapping most of the car to get Xenons. They do have a shorter life, as mentioned. I got 2 years normal use out of the last set, and have had 3 so far out of the current ones, so expecting them to go soon!